If you would like to know more about ELDee The Don, here is his Facebook page and his twitter channel. The attached zip file contains the original uncompressed files of the session. Please download it and import these files in the DAW you use to make music (It does not necessarily have to be Logic Pro!) This way you can practice your skills and mix this song using your own tastes, tools, plug-ins and the guidelines provided in this video. This video was kindly subtitled in Spanish and Italian by the guys at Fuseroom studio. Good morning children! Today, we're going to mix a hip-hop song in Logic. I do get a lot of hip-hop songs in Logic, so I'm gonna show you how we do that. Our artist today is from Lagos, Nigeria, which is in Africa. His name is eLDee - The Don, which may, or may not be his real name. The track's real name, however, is Wash Wash.
"Do not push me, 'cuz I'm close to the edge, I am trying not to lose my head." Let's mix! The first thing we should do, as always, is listen to the rough from the producer. In this particular case, when I got the track, I thought to myself: this is really good, what can I do for it? Then after a couple of listens, you always come up with stuff you'd like to do better. Let's listen to, say, Intro, Verse, and Chorus, and get a vibe for the track. My first thought when I listen to this is like: Wow, I love the track, I like the production, it's really interesting, everything hits hard. My problem is that everything hits hard: the drums hit hard, the keyboards hit hard, the vocals hit hard, everything is in your face, all the time, I'm not quite sure what to listen to. So I think my work here is to decide what's the most important stuff, and create contrast between the front and the back, the top and the bottom, and make sure that the chorus actually lifts, because right now, it's a big ribbon of music, and I'm not feeling a big lift between the verse and the chorus. I'd like to really feel when the chorus comes on, and be like: Wow, this is the chorus! All that work needs to be done. If you look at my session, you'll see that it's already organised the way I like it. This is not the way the session came to me. In a spirit of full disclosure, let me show you the original session. This is the original session: all the vocals on top, and all the music at the bottom, organised whichever way the producer felt comfortable with, which is not the way I was comfortable with. So I reorganised my Feng Shui, and did it this way. Your mileage should vary, you should organise it however you want to organise it, not the way I organise it, this is just an idea, but it works for me, because I do it the same every time, which cuts down on the thinking. That's the spirit: no thinking, more feeling. On the mixer side, I set everything up for stem mixing. For a quick overview about stem mixing, I suggest you look at the dedicated Stem Mixing video. Until then, let me give you a quick overview of my setup. All my bass drum go to Bus 3, which is a drum stem bus. All my drums go to 4, which is a drum bus. 6, all my keyboards into a keyboard bus, 7, all my lead vocals in a lead vocal bus, 9, all my background vocals into a background vocal bus, and 8 is a different background vocal bus, because there are two different kinds of background vocals on this song. You'll notice all the stems on the right, right here. All those stems go to Stereo Out, which means this is summed in the box. But, I'm actually gonna use hardware on the Stereo Out, and go back in after, I'll show you in a second. You'll notice here two reverbs. Those reverbs are hand-me-downs from the producer, he picked them, might as well use them. And you'll see here a bunch of plug-ins that I did not put on. Those are also the producer's plug-ins. My idea is to enhance what is done, not to start from scratch. So let's mute all the stems except for the drum stems, and listen to the first verse, which lives about here. Now... (drum beat 1) is actually not as present as the (drum beat 2). So let's see who plays what. The most important bass drums are here. Ok. So that's where the fat should come from. I hear some fat, but not enough, I think. That's cool. That gives me some super-low trail. All the bass drums together. Kind of a snare drum kind of thing. And how about this one? That's cool, but it's really... peaky, and muddy, in a certain kind of weird way. Alright, cool! So let's reorganise this. The first thing I hear is that this is really dry, and electronic sounding. Let's listen to just the bass drums, the main ones, the "Boom, Boom" ones. Ok, I think they sound great. They sound a little flat, and a little dry. I like this one. This is a cool space. I don't use many presets, except for reverbs, because they have so many settings, and also they recreate a certain space, and those spaces don't change much. So I have this... Discrete Drums Space. It's pretty subtle, check it out. With. If you can't quite tell it, listen to the high-end, to the attack of the bass drum, and also listen to how it feels when the bass drum is done playing. The silence after the bass drum is still from the bass drum. If you listen carefully without the reverb, it does "Boom, Boom!" And then with the reverb, it does "Boom, Booom...", it's got a little bit of a tail, but not an annoying tail. Check it out. Got it? Ok, I'm gonna put it on the other one too. Just copy it, lazily. Look at it. This is what it sounds like dry. It's a bit much, I'm gonna lower it a little bit. That's cool. The two bass drums together. You see what I mean? A little bit of that. Now I feel the first bass drum could use a little bit of "Boom, Boom!" That's a technical term. a little bit of 80Hz. Waves makes this great plug-in called RBass, which is pretty much the best one at doing this. And oddly enough, the Default is about 80 Hz. Let's find out. in-your-face hip-hop kind of punchy bass drum. So I'm gonna add it to the second one. I'm gonna use the Sonnox Transmod, and see what it can do for us. Just the second bass drum. Ok! Just a little more attack. The two of them together. Cool! That third bass drum is great. I don't think it needs anything. So I'm just gonna hit it with a little bit of an EQ. I'll play it again, without the corrections. So it's on the "Boom, Boom", ok? Hear the "oomm" thing. Why am I removing this frequency from this instrument right now? Because I remember listening to the rough, a few minutes ago, and telling myself: it's a little bunched up in the low-mids. Now, how do I know it's this track that was the problem? I don't. I'm thinking it's this track, so I'm gonna work on it now. If I screw up, I'll know in a few minutes, or hours, depending on how well the mix goes, that I screwed up on this move, because I remember I made this move, and if I have a problem at 120, I'll come back to this track. So let's remove this, and see how it goes as we go along. Here are the four bass drums. And here are the four bass drums with no correction. Alright! Let's turn everything back on, and find out what we have for a snare drum. I remember it being Percussion 1. I feel that this snare has a really, really sharp attack, with a lot of dynamic range, a lot of peak over average. Let's look at the meter, and figure it out. Look at Peak & RMS at the same time. Check it out. There is 10 to 12dBs of difference between the Peak and the RMS of this snare. What's the problem with that? This is gonna prevent me from making this record loud. So the first thing I'm gonna do is I'm gonna limit the peaks of the snare, just to keep it tight, not to change the tone. I'm gonna try to see how much limiting I can do on this snare, without changing the tone of it, because the producer clearly has a vision of how it should sound. I just have to fit that vision within a modern record medium. I'm gonna keep the Level Meter down here, so you can see what's going on. I'm gonna add the Oxford Dynamics, which have a great limiter on them. Obviously, I'm gonna take the attack down, because the whole point is to take the attack down. I feel we've kept the identity of the snare, but we've gained a lot of dynamic range. Check it out on the Level Meter. That's a good 7dB, maybe 8dB. That's a lot better. It's still punchy, it's got a lot of attack, but it's not in the way as much. Next! Like the bass drum, I feel this is a little bit dry. Check it out. How about a little bit of a space around it? For some reason, I feel like using the Oxford reverb. I can't tell you why, it's just an intuition, maybe because I just used the Oxford Compressor... not sure. I have a couple of presets, especially for drums, that are in line. say I take this one, All Purpose Space Inline, the 100% Wet is off. That allows me to just press Play, and listen without having to mess with the settings. Cool, but not what I'm looking for. I have also a darker one, that I usually use on snares. It puts a little bit of space, it makes it less raw. I like it. The snare feels a little dark, I'm gonna open it up a little bit with the Pultec Pro. Usually, 5k works for me on this thing. some serious 10k... like here. I don't need the Level Meter anymore, let's get rid of it. I still feel like this snare could use a little more bite in the high-end, and I don't want to EQ it more. So I'm gonna try the Enhancer from UA, and see if I can get something out of it. I feel that it's missing something up there, in the 7k range. That! If you can't hear it yet, let me point it out to you. Listen to the top of the snare, the part above what you usually hear as a snare. There's a little bit of a fizz that comes on when I put the Enhancer on. I like that, because it's weird, and weird is good in this case. Let me exaggerate the effect, and then I'll bring it back in. I like that! It brings that little "pshh" thing on top, which is completely unnatural, but fun. Sometimes, unnatural is fun! I'm lacking a little bit of attack. I think that I can put a little bit back in. So why would I want to put a little bit back in, instead of limiting less? Because the limit is taking care of that initial peak. With something like a Transmod for example, I'm able to really tailor the attack of the sound the way I like it to be. and play with it! Without. Maybe a little bit less of the Overshoot. The Overshoot is the length of the transient. You can actually lengthen the transient with the Transmod. So, that's a bit obnoxious. I'm gonna do it a little less, like this. As you see right now, I have a bit of a shorter transient, but a little more of it. Maybe too much... not sure. There's a function here that lets me overdrive the transient, which is kind of cool. Check it out. I really like this sound. Obviously, I'm clipping, so I'm gonna bring my fader down a bit, so that I don't clip. And I feel the bass drum could be louder. So let's play with the bass drum balance. Maybe this could be really loud. and call it Drums. I always have some preset things. I can take them down all together, thanks to the group. Probably raise the snare a little bit... It sounded like this when we started. It's starting to sound good! Let's listen to Percussion 2, the one that went "Boom, boo-boom..." in between the bass drums, that went "Boom boom, boom boom." So clearly when it goes "Kong-a-dong", there's a little bit of a nose thing going, which is in the way... for me. and look for that "mmm" thing. So clearly, that's where it sat. I went too far. It could use a little presence, maybe in the 3k range, or 4k range. It's a little bit like a hi-hat, right? It takes the role of a hi-hat. It creates subdivision to the groove. I want a little bit of presence up there, I like that. So here in this track, I have something that's just right for the track, but lacks a little bit of excitement. So I'm gonna look for the excitement with Decapitator, using saturation and things that I don't really know how they work, but sound good. Check it out. I'm in love with a plug-in, let me show you. Out of all these models, I usually jump for the N model, which, I have a hunch, means Neve. But let's look for something else, let's try E today for a change. Maybe that's EMI, we don't know. Now, I find that exciting. Check it out. Without. I have a feeling that maybe this Enhancer thing could work here. What if I copy the setting? Yeah. It floats better in the air, right? So we have the Cambridge to get rid of the stuff that's in the way, and add a little bit of presence at 3k. But obviously, I couldn't get what I wanted out of it. So then, I did some saturation with the Decapitator, and then, I added that "pshh" thing, that we did on the other snare, on this thing, using the same Enhancer. So this is my drums so far. the next really important element is the drum rolls. Let's listen to that. Unlike all the other tracks so far, that really had a vibe of their own, this one feels a little bland to me. It feels like a program beat from a standard plug-in, I don't like it. So what I'm gonna try to do is give it a lot of vibe, and usually, when I want to really mess with something, lately, my choice is being Devil-Loc Deluxe, because this thing is absolutely ruthless. Hear when it goes "Tan gumm..." Hear without. Now, the... (triangle beat), that triangle is really annoying, it's probably in the 3 to 4k range. Let's EQ it out a little bit. Let's listen in the context of the whole drum set. It feels a little dry in the context of the rest of the drums, so I'm gonna add some reverb. Since I'm lazy, I'm just gonna copy this one over, and listen to it. That's not the effect I'm looking for. I'm really looking to make it a little dirty, and garbagey, so let's try the other space. I like this, because now I have the snare here, the bass drum here, and now the toms are here. So instead of having everything bunched up together in the middle, and hanging out together, there's distance between the drums. If we listen to the rough mix, just for that section, of course there's everything else at the same time, but it's always educational to listen to the rough mix, for the drum sounds for example. This is the rough mix. And this is our current spot. Ok! We're in good shape! As far as I'm concerned, hip-hop is drums, and vocals. So I did the drums first, now I'm gonna switch to doing the vocals. Let me unmute them over there on the right, in my stems, and listen to the verse. That's a lot of stuff going on. There's a delay going on, and I hear the delay from the other tracks still live. So the first thing I'm gonna do is mute all delays, and listen to the track again. It's peaky... Let's fix that. Let's look at what the producer had on. So, he's using the built-in compressor, and he's using it on stun. Let's get rid of the Auto-gain. The reason why I wanna get rid of Auto-gain is so that I can listen to the vocal, Pre- and Post-compression, at the same level, to make sure that I like what the compressor is doing. So for example, right now, let's listen to the vocal with no compression. I dig it! So, what I don't dig is all that brightness here, so I'm gonna remove that. I feel like the delay and the reverb were an integral part of the sound. I had all that garbage coming from all the background vocals. So why don't we just mute the background vocals, so that their Aux sends become inactive, since they were Post. Now that the background vocals are muted, I can turn the reverb and the delay back on, and figure out what the producer wanted for a vibe. So let's look at what he chose for reverb and delay. Standard SilverVerb, and the Tape Delay, which is pretty awesome. He actually used the Default setting on the SilverVerb, and the Default setting on the Tape Delay. Why not? I think it works. This is just the reverb. It's got a little bit of that spring reverb, like 80s kind of broken spring reverb vibe. I like it... Keep it. And then, Tape Delay. It's mono, it's dark, it's perfect. I'm not changing anything, I like this vibe. Now, I still feel we need to address some problems on the vocal, like for example the s's. Let's go straight for... Eiosis. Listen "3 K B I Ssss..." Without. It sounds great. No need to kill a dead horse. I feel I could use a little more "Mrmrr!" And, although it's counterintuitive, I think it's gonna come from a little bit of compression. What I'm looking for is some nice transformer emulation, a little bit of containment, not squishing, just that "mmm" that comes from, say an LA-2. See how it's more steady, and a little more dense? I know it's subtle, but I like it. It's a color thing. I like what the LA-2 does to the attack of the vocal, and to its presence. It's just a presence thing, it doesn't really sound more compressed, it just sounds more present, which is nice. Then, the De-esser's cool too. Now... I feel like it could be opened up a little bit, so I'm gonna use my trusty Pultec Pro. Listen to the forehead of the vocal, just above the nose. It could use a little bit of super high-end too. Then a little bit at the bottom, just for... "Oomph." Hear how on "They say", it grabs the bottom, it's really bouncy? If I add a little bit of 200, you'll hear that more. 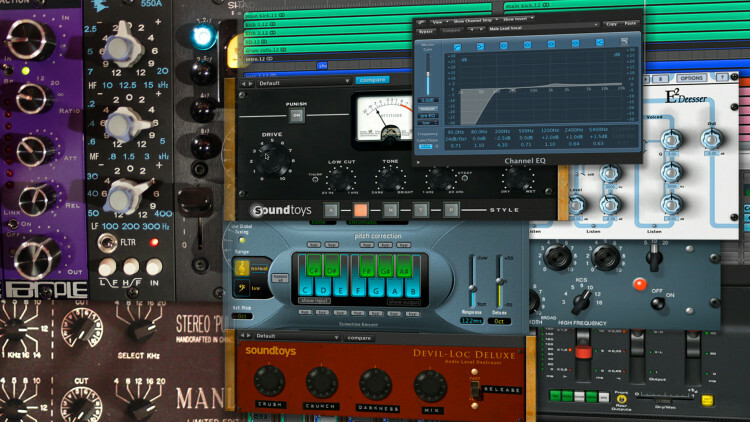 Without the last three plug-ins, how we got it from the producer. And with the last three plug-ins. I like the sound, let's listen to it in context. I like this! It's a good basis for my song. I have my bottom, I have my middle, I have my highs. Everything else is gonna be decoration. What I'd like to do now is set up my hardware, because I know I can get a little more "Oomph" out of my 2-bus processing. The first thing I'm gonna do is set up my compressor. In this case, I'm using a Dual Vandergraph from Shadow Hills. I just got this guy, so I'm still figuring it out, which is kinda fun, so I discover new stuff. What I'm gonna do first is turn it on, at 1.2:1 Ratio, which is a really gentle ratio. Then I'm gonna match levels, add some compression, and then play with the filter keys. First things first, flat, then turn it on, match levels, add compression. I like what it's doing. It's bringing the instruments together, and it's really enhancing the attacks. In the Full bandwidth mode, I feel like it's smothering the track a little bit, and the bass drum is pushing down. What the High-pass Filter key does is it prevents the compressor from listening to the bass drum, because the bass drum are 200 and below -ish. basically not tell the compressor that bass drums are there, and that way, the compressor doesn't compress the whole thing every time the snare drum hits, so it makes for a more linear and fatter sound. Check it out! This is with the full bandwidth. It's pretty subtle, but it's kind of fun. And this is with the 150Hz high-pass on the key to the compressor. It's definitely bouncier and fatter with the high-pass on the key. The amount of compression, I'm not sure yet. This looks good right now with this, but when there's more instruments, maybe it'll be too much, I don't know, we may come back to this. What I'd like to do is complement this little bit of compression with a little bit of EQ on the 2-bus, maybe my Bax, and my Manley Pultec. low-pass, on the Bax, because I know I probably will not need anything below 24 or 30Hz, and I definitely won't need anything over 28k. So, I'm gonna compare here, with and without. This is with, this is without. First, without. The bottom of the bass drum is a tiny bit cleaner. Check it out. This is gonna let me carve the bottom the way I want it, because it's a little leaner now, it's got a little more room. There's nothing flabby going on. Usually, I dig the Manley around 60Hz. That's what it's for, I like it best for that. Check it out. See how much more generous it gets? So what I'm gonna do is I'm gonna show you both. This is flat, with no EQ whatsoever, and this is with the high-pass, and the 4dB boost at 60. Perfect! This is nice and fat, but still controlled. Now, I can use the super smooth high-end of the Manley Pultec to open up the vocals and the top of the drums. Check it out. It's starting to sound really hi-fi. I like this very much. maybe a dB or so, check it out. Actually, it could be lower, and maybe a little more. Meanwhile, back at the ranch, we're gonna turn some keyboards on! The first one is called Lead. Let's listen to it. So, obviously, this makes the song. So, in context. I think it needs to be a little more aggressive, and I think it needs a little bit of space. In this case, I think it's more a Decapitator situation, so I'm gonna copy it, from last time I used it, look at it, and listen to it. It felt a little bright, otherwise it felt good. Some space, I think, would be great as a delay. so I'm gonna bring EchoBoy on. I like this answer... I like that. And then, I'm high-passing it a little bit, so it doesn't take too much room, adding a little saturation... Let's listen to it in context. And I like the wash that the delay creates in the part, the fact that it's a little messy in the background. It fills out a verse that's pretty empty otherwise. To do that, I lowered the tempo all the way down, I didn't even sync it to tempo. So, this is how it sounds. I see Lead 2 coming in second half of the verse, hence the name, Lead 2. I like how all these units and parts are actually building all the way to the chorus. It's very simple, but it's very hard to do such a tight arrangement, with such few tracks. Great production. What do I feel like doing on this Lead? In this case, I just feel like copying the delay from the first Lead onto the second Lead, to create some unity. Check it out. What else do we have? I'm looking here, I see strings right above the Lead 2. I dig that. Let's loop this part, and find a sound for it. This sounds a little bit plug-in-y to me. I hear the reverb tail. That's a cue. He wants it to sound grandiose. So I'm gonna make it sound even more grandiose. It needs a little bite. There's a Decapitator here, let's copy it. Ok. Now, notice how the "mmm" at the bottom is gone. I hear reverb, I want more! 250 tends to be perfect for this kind of stuff. The first thing you do obviously is remove the Wet Solo, because we want some of the direct signal, make it really long, and kind of wet. It's obnoxious! Alright, let's see in context. Why not? It needs a little more overall "Oomph", and presence, so I'm gonna just bring out the Pultec. and a little bit at 10k. I tend to love the 5k on this Pultec. It sounds like this. On the other hits, it sounds like this. I guess, alright... This to me feels a lot like the strings, so I'm just gonna copy the reverb from the strings. It's cool, because I see that it works with the strings here. Check it out. The two of them together. I see something called "Beep" coming in on the second verse, or on the second half of the first verse, right here. Check it out. Wow! Awesome! Totally chaotic, unregular, I love it. Check it out in context. That's badass, check it out! The first two hits are quantized, the third hit is a little bit lazy. Now listen to it with the drum pocket. That's fun! Alright! Not for everybody, it works for me! Let's see what else we have... Chorus Pad, oh yeah! I remember something coming in on the second half of the chorus. Ok! I like that. It feels a little real. So let's try and soften those transients and that "plug-iness", with the trusty Studer A800. I wanna soften the high-end, make it fat. The Studer is good at removing the fizz, without making it sound too dull. some sort of a Plate, but not the same one as the others, so I can have some contrast in the color. How does this sound? It sounds like it's underwater. I'm gonna remove the All Wet button, thank you! Without. The chorus strings, as they came. It sounds a little bit like a Fun Machine, if you know what a Fun Machine is. Those are really fun, hence the name, Fun Machine. Without the processing, it would have sounded like this. While we're on the chorus, I noticed that we didn't open the bass. Let's listen to the bass. I had to solo the drums with the bass, to get a vibe for what the pocket is, and what its position is, vis-à-vis the bass drum. I think it needs more bite. Bite so far has been... Decapitator! Let's copy the Decapitator over. Let's put some delay on it, to make it blend with the rest of the track. To tune the delay, I'm gonna listen to it with just the bass drum. It's not really a bass, per say, but it's fun. It comes on the chorus as a lift. Just the bass drum and that "bass". It sounds like this. The tempo is not exactly right, and I like that. That's a fun thing. Let's listen to everything. In this song, essentially, the bass drum is the bass, is the bass drum, which is also the bass, which is also the bass drum. I think that's it for instruments. No! There's one more: Sweep. Where is the Sweep? Let's look at the Arrange window... Here we go. Let's just be brutish about it, same reverb as anywhere else. I like that. Check it out in context. It could use more of it. Next! I can see all these background vocals on the chorus. Check it out. in solo, just to see what it does. I'm gonna select all of them. Actually, let's make a group out of them. Chorus Backs' perfect! We can solo them, and listen. Ok. So I'm looking at the stuff that came from the producer, and I see that same Rap Vocal Compressor setting. a little bit of presence around 1.2, which I'm probably not gonna dig, and then some high-end, which obviously we don't need, because it's really bright. So I'm gonna get rid of all that for everybody. Alright. So all the boosting in the high-end is gone, across the 1, 2, 3, 4, 5, 6 tracks of background. That's much better! I'm going to leave the pans where they are. They're probably there for a reason, and, same with all the other pans I've had so far. The producer put the pans in place, I'm gonna leave them there, unless they bother me. In this particular case, those "Shhh" annoy me. I remember a while back, making a preset on the Eiosis De-Esser... for "Shhs." I called it something like "Fab De Sshhh..." So I'm gonna copy that everywhere. For you to be able to hear what's going on, I'm gonna play you one of the guys in solo. You don't have to take them out of the group, if you want to listen to just one. What you can do is Open Group Settings, and then, disable that group, momentarily. So this is the one we want to listen to. I can just solo this one. If I want to solo everybody, I just hit Chorus Backs, make sure that Solo is part of the attributes, and now I can solo the whole group at once. That's a nice Logic feature. I'm gonna disable it right now, solo the chorus vocal, and play you the track with and without the De-Esser. I'm gonna be able to solo the "Shhs..." with the Listen function here. 6k is a good spot to look for "Shhs." It's a little lower than "Sss", which is higher. That's why I made a preset, so I don't have to go for it. In this case, it works. Let's see if it works lower. Let's see in the context. I was at 6k on my preset. Let's re-enable the Chorus Backgrounds group, and listen to everybody. That works now. It's no longer sticking out of the mix. I don't know if it's as cool as the rest, so maybe we could give it a little "je ne sais quoi". take care of that, easily. So, actually, let's listen to just one guy. bring this guy back up, and disable the group. I'm gonna use this pitch correction system, not to pitch correct, but to make it sound weird. On the Logic built-in Pitch Correction, the first thing I'm gonna do is make it really fast, so that it tracks really quickly, and then I'm gonna remove some notes. This song is in some weird mode of D#, so it sounds like this. So, that's a sound we've heard. Now I'm gonna copy that to all the background vocals. And listen to all of them. Also, it adds a fun thing to the tone of it, right? It makes it a little thinner, a little weirder. This is the way it was before the pitch correction trick. It's kind of like a weird chorus, but not really, but yes, but no. I like it. What else do we have? There's a track here, called Chorus Back, let's check it out. That's nice, that's gonna be a nice shine on top. The "Shh" is still annoying. Let me copy the pitch correction. I dig it. It's nice, a little shine on top. Without, it sounds like this. Check it out. It was a little loud, so I take it down a little bit, but it's a nice shine on top of the chorus. mostly on the verse! Let's go back to the verse. Ok. I need context. Here's the context. Ok. The "Shh" is annoying, I'm gonna copy it over. as opposed to everything else being delayed. It would sound like this. Let's compare to make sure we're not butchering the vision of the producer. Much nicer to hear without, I like it. It's got this presence to it, and then, good contrast with the rest. I'm gonna keep it like this, unless someone gives me a call and complains. Just to situate where we are, I wanna listen to everything since the intro. We hadn't heard these intro vocals. I'm not sure when they turned on, but they did. I like the way they sound, but I feel like I want the first bass drum to hit harder. well, the balance is good elsewhere, we like the balance after, so for me, to feel like the bass drum is hitting harder, I'm gonna lower the stuff that's before. So what's happening before the bass drum? That vocal, which I hadn't heard before, and what else? So... the bell and the vocal. I'm gonna lower the bell, I'm gonna lower the vocal. The second intro vocal is too loud too. So I'm gonna lower that. Now the intro feels like this. First, that delay on the Lead synth was a bad idea, so I'm gonna get rid of that. EchoBoy... Maybe, let's try and putting it to tempo. That's better. Let's listen to it in the hole. Where's that hole? It was not at all the effect I expected... So I changed it. Here! That's no longer annoying me. The other thing that was kind of weird is the vocal needs to be ridden, we'll take care of that in a second. Otherwise, I dig it! I think it's punchy. Maybe I could use a little more shine on the background vocals. a little bit of a shine, a little bit of a smile here, and a little bit of high-end around 10k. a few points at 10k, 5 or 6, a few points at 5k, and maybe a little bit of a hole at 200. I just talk too much, so listen again, flat. So you saw me tame it a little bit, cause it felt like too much, right? Now, I feel like it's cool, but it needs its own reverb, to give it a special space, so when the chorus comes on, it really lifts, because you're elsewhere. Solo safe it. Feed it into the same Output, which is Bus 9. Let's solo the chorus vocals, and check out how it sounds. I'm gonna make it psycho, so we can hear just that. some of that Send into the 250, which is also routed to the Chorus Vocal stem. I like what it's doing. It's creating kind of a wash, perfect for the song title. Check it out in context. I like how it fills the space, and how it makes the chorus bigger. Check out the transition between the verse and the chorus. Let's get rid of those plug-ins. Check it out. I like this. It feels very expansive, with an A. Now, I think I like just about everything. It would be a good idea to check with the original mix. and listen to our mix. Versus the original mix, that the producer sent as a reference. I like the rounder, fatter, thicker vibe of what we've done. "there is something about my mix that I like better." And what he's gonna like better about his mix, is that the vocals are more aggressive, especially the lead vocals. I kinda dig the EQ we have. I think what would be cool is to have it more saturated, and more in your face. To do so, I'm gonna add a Maximizer. So... where is it? Here. And then, I don't know... Start here! As a reminder, this is without. I dig that. Now, I'd like to have that on all the vocals. I'm gonna put a little bit of that on the Vox Pack, which is the "Now Wash" part, bus 8. Here we go... Precision Maximizer. Just a smidgeon, to taste, and copy it to the chorus vocals. Let's see how that feels. Obviously, now with the Maximizer, the background vocals on the chorus were a little too present, and excited the reverb too much. So I took them down, and I lowered the amount of Send into the reverb. Let's go back to the verse, and compare with the old mix. I think we've achieved exactly what was needed. Listening to our mix, we hear more bottom, more fatness, we still hear a lot of presence on the vocal. Listening to the original mix, I can hear what usually happens with somebody who works on a track for a long time, or works on a track really quickly. A lot of compression going on, the vibe is great, the tones are great, but it doesn't feel expansive, and it doesn't feel bouncy, and there's no depth. So what we were able to achieve is respect the producer's vision, not make it so bright so it hurts your eyes, drop the bottom quite a bit, move the drums forward, give some space on the vocal. Let's listen to the mix, the old mix, on the chorus. Ok. So the point here is to listen through the problems of the original mix to hear what's good about it. in the balance of the original mix, I actually like where the background vocals are better. high octave on the chorus is too loud, I'm gonna lower that. Let's listen to it again. Our current mix. the verse vocal, or the lead vocal, whatever you wanna call it, so that it's always present. And that's missing right now. I think it's just too loud. We got carried away, comparing to the old mix, and I think it ruined the balance of our mix. Let's listen to that again with a dB less of vocal. listening to the transients, and to the attack of the words, and the relationship between the bass drum, the snare drum, and the vocal, I felt like it needs to go down once, twice, now we're back down to 0dB. Also, the "Now Wash" background vocals had to come down, they bothered me. even looking at anything, let's just listen. Download the tracks, have fun mixing it. This was fun and very interesting. Thank you very much for your wisdom. I believe here the whole point is how to mix and still respect in full the vision of the producer. This is very important and this video is a living example of it. @Fab: Great, thanks for the quick reply! @j.peters: This kind of music tends to have the most energy in the middle. I have learned to pick what goes on the sides to keep it hitting hard and not sound too precious. It really is production dependent. Great mix! Quick question, I noticed you don't do much panning other than some of the vocals. Is this something that you did later, or do you generally like to keep most elements directly in the middle? Thanks! Hi Fab. I found something weird in your processing of the "snare". You put the transient Mod after the reverb >> when you put it on, the reverb effect disappears. Wouldn t it be better to put the reverb after the transmod designer to not affect the space with dynamic treatments ? can you give me vocals that are not already processed? I'm not digging the compressor on it. @edouarddarracq: It would have sounded different. Because of how different DAWs make you do different things through their interface. And their gain stages are all different. Thank you Fab. If you were mixing this song with the exact set up, but on pro tools. Does this mix would have sound better? Logic pro = Pro Tools about the sound quality! @redFiELD: I do both when I mix. For the sake of demonstration though I tend to hit the solo so you guys can hear what is going on. 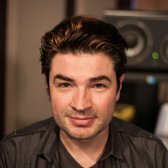 @Fab: Du you always work with EQ and Compressor on the individual sounds/channels in solo instead of "in context"? Great! I like Fab's teaching Style and vision of Mix. Hi Fab Great as usual. Question. Is it possible to get these videos in HD? It's not easy to read the text in the video. Its really all about the audio but the fuzzy text is a little distracting. Also, why did you choose to sum in the box and treat only the stereo out? Thanks.. Awesome job as usual! Thanks for sharing your knowledge. You are a genius! @shroombaker: ELDEE loved the mixes. Very few changes, mostly vocal levels. We mixed the whole 12 songs record in 3 days even though it was much more involved than traditional Hip Hop records as far as track count goes. ELDEE went on selling very very very well in Nigéria. @nezy1: I probably missed it because it's hard to mix that fast and keep the quality of the mix up. That said I hear no clipping. If I had heard anything I would have addressed it. Logic's clip led have a mind of their own sometimes. Thanks, Fab. So after all the magic, what was the response from the artist & producer after delivering the mix? Did it fit their vision, or did they request changes? Thanks Fab! Learn a lot of new stuff. Great Video! You never let me down! Exceptional! Excellence on the highest order. Fab's teaching style and focus on detail is second to none. Thanks for a great tutorial.